Soon after the launch of HTC 10, the company has reportedly launched HTC One M9+ Prime Camera Edition in India. A Mumbai-based mobile vendor Manish Khatri on Twitter has claimed to have received shipment of the One M9+ Prime Camera, which can be purchased at his store Mahesh Telecom. 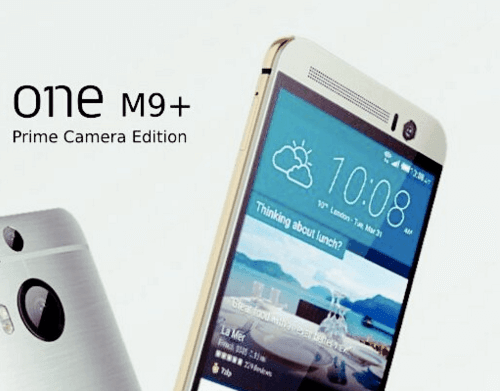 This model borrows the looks of the One M9, but changes a few of its specs. The new One M9+ Prime Camera Edition sports a 5.2-inch full-HD display and comes packed with a 2.2GHz MediaTek Helio X10 SoC processor couple with 2GB RAM. There is a 16GB expandable internal memory for the phone and it runs Android 5.0 with Sense UI on top. A front fingerprint sensor and 2,840mAh battery are the other additions. As the name implies, One M9+ Prime Camera Edition’s highlight is its camera hardware. It comes wth a 13MP with dual-LED flash, OIS (Optical Image Stabilization) v2.1, BSI back-illuminated sensor, autofocus, F / 2.0 large aperture, 27.3 mm lens and 4K HD recording ability. On the front, it houses a 4MP camera (ultrapixel) with BSI sensor, f/2.0, 1/3-inch sensor size, 26.8mm lens, HDR and full HD-video recording. The One M9+ Prime Camera Edition carries a price tag of INR 23,990.
i want to know whether this phone support cdma for calls only. i am using mts.. please suggest whether mi5 support cdma?i use wifi for data. thanks.